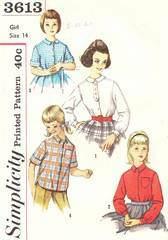 Vintage McCall's pattern 3613. Girls blouse with back yoke may have short cuffed sleeves or long sleeves gathered to buttoned cuffs. Two collar styles and optional button-down version. Option for pointed tab at center front or breast pocket and top-stitching. Girls' Size 14; Breast 32; Waist 26. Pattern is complete and has been carefully cut and used. Envelope and contents are in excellent condition.